A couple of weeks ago Lady Voluptuous announced their newest dress addition - The Ursula! 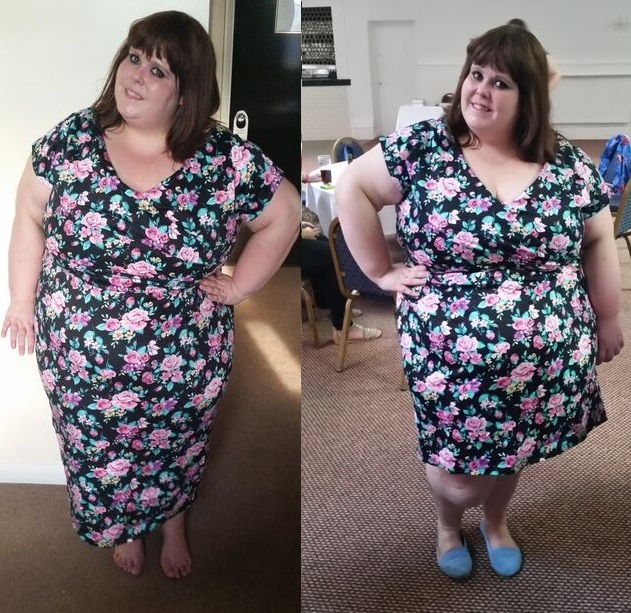 I loved the wiggle style dress straight away and knew it was a cut I would be really keen on. The patterns are so lovely too, which makes it a firm favourite of mine. They sent me a couple to try and asked me to keep my fave... Can you guess which one it was? I actually like both of the prints and think that they would be at home at different style events. I like that there are dark and light patterns similar to each other, to help ensure that there is something for everyone. As you can see the dress worked fine on me, even though I am much shorter than Georgina. However, I think with this type of dress you can get away with shorter and longer lengths so that's just fine. I found the size to be similar to the Bellatrix, nicely fitted and I love the short sleeves. BUT - Which one do you think I kept? I kept the black simply because I loved the bright floral pattern against the black background. However not one to play by the rules I found a new way to wear it too - don't you just love a dress that is versatile? 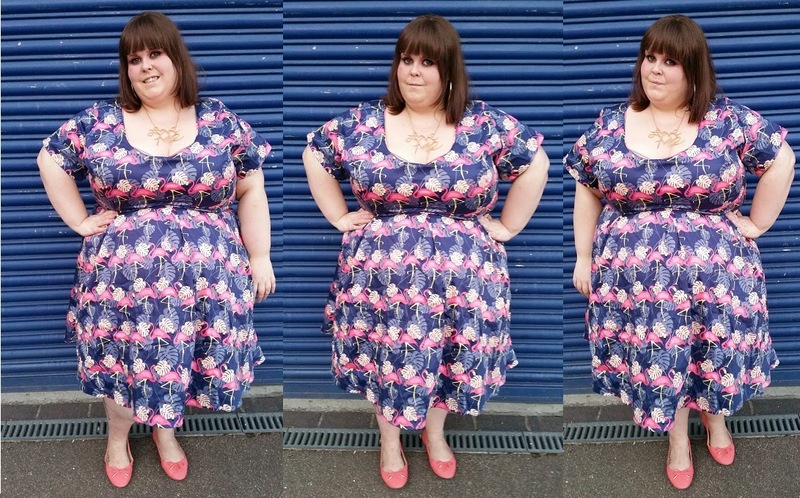 I have blogged about Lady Voluptuous very many times, so I won't talk too much about them. 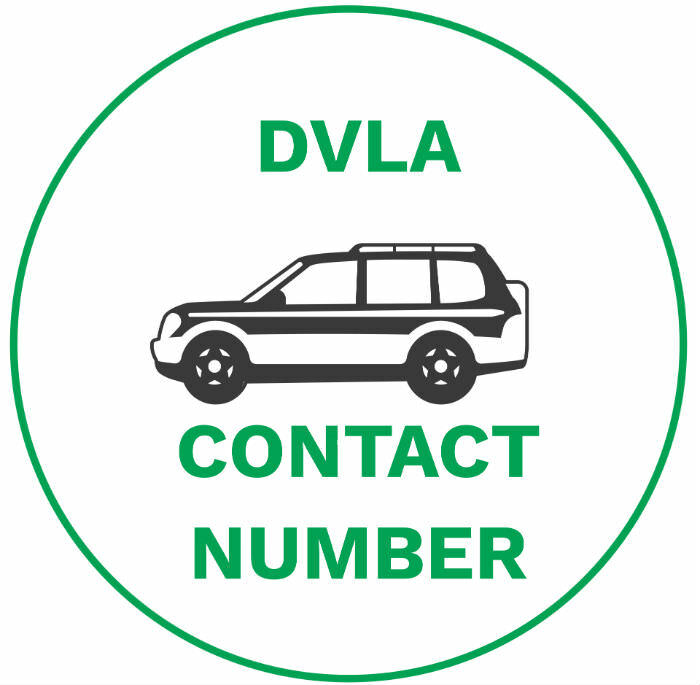 You can have a look at previous blog posts about them to learn all about the brand. A few weeks ago they sent me one of their brand new Cosette patterns to try for myself. I love many of the Lady Voluptuous dresses but this probably isn't one I would try for myself at first glance. The Phoebe and the Bellatrix were perfect for me because of their shape. I prefer short sleeves to long and a wrap effect is sometimes hit and miss so I often avoid. That said, I love that this brand even though it is in its infancy have a range of styles for everyone. I initially got the Queen of Hearts Cosette in my normal size but it was too big on the upper part of my body so I sent it back and exchanged it for a 26/28 - it fits like a dream. My only issue with the sizing is the belt which did not fit me - however, the 30/32 belt fit perfectly so it is a shame. However, remember they're a new brand and always learning and listening to feedback so I have every faith this is something that can be fixed. What I love about all of the Lady V London dresses I have tried so far is the quality of the material. The material is nice and thick which gives a nice fit and helps you to feel supported when you wear it. This makes it comfortable to wear all day/night. I love the length of this dress on me and I think it really helps to add to the vintage fit and feel. 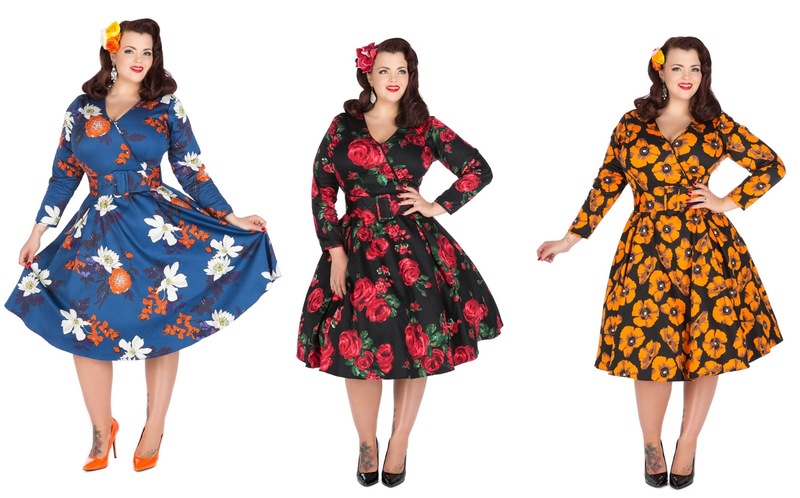 I have to mention that these vintage style dresses go up to a size 32, which is fantastic. All of the other brands tend to stop at least a few sizes smaller than this, which is such a shame. The pattern of this dress is lovely and I can only imagine what it would look like dressed up with a petticoat - perfect! I am so glad I stepped outside of my comfort zone to give it a try! 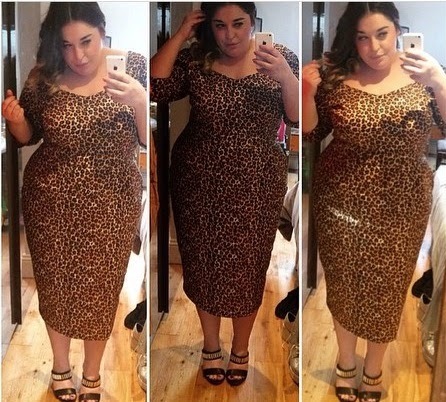 Do you own a Lady Voluptuous dress yet? Which is your favourite? Great Flaming Flamingos - A Lady Voluptuous Review! 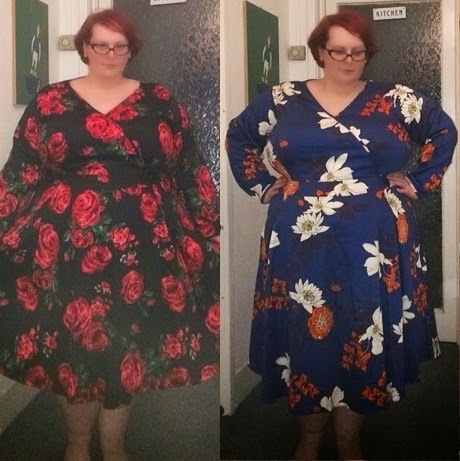 I don't want to talk too much about Lady V London and their sister brand Lady Voluptuous, because I have swooned over them on many a blog post previously. If you haven't browsed their selection then I suggest you do, if you're between a size 16 and 32, they will have something you'll love I'm sure. (Lady V London actually do much smaller sizes too, yay for inclusive brands). As soon as I saw the Phoebe dress I knew I had to have her. I have loved all of the dresses so far and you might remember I reviewed the Bellatrix a few months ago. As much as I loved them all, I knew that the Pheobe would be right at home in my wardrobe. The fitted bust and the flowing knee length skirt are a style I know and love - the built in petticoat an added bonus. Size wise I would say that the dress comes up slightly small, especially if you have a large bust. I wore my normal sizes as I don't mind fitted items at all, but it could be worth sizing up if you prefer being able to breathe ;) (It wasn't that bad). As with all of the Lady Voluptuous dresses, you can tell that this has been thought about. The arms are a great fit and the skirt is generous. Due to having a large belly (who knew) I haven't always got on with petticoats in the past, they just don't sit right. However, the petticoat added to the underlayer of the Phoebe dress is perfect and gives a little lift to the dress - perfect! NOW! Let me tell you about the pattern - Well, I don't even need to tell you about it. JUST LOOK AT IT!!!! BRIGHT PINK FLAMINGOS! I find the whole concept of Lady Voluptuous really exciting and I can't wait to see what Georgina and the Lady V London team have up their sleeves! 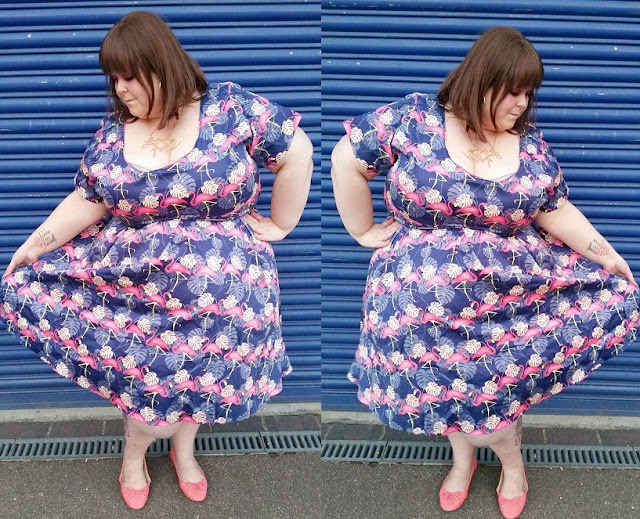 Have you got a Lady Volup dress? Tweet me and show me, I'd love to see! 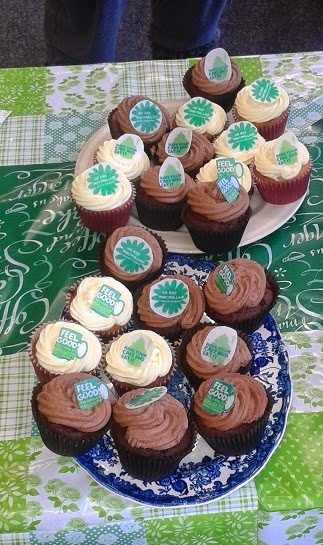 A really, really quick blog post today, my world has gone crazy! 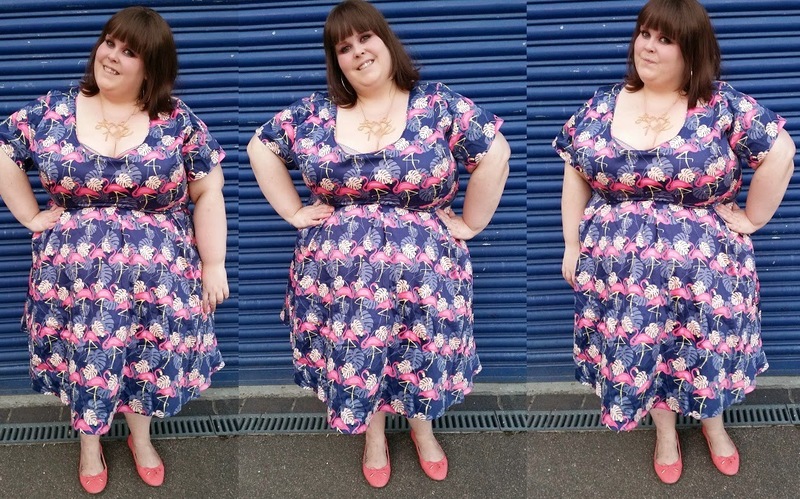 So many people are supporting are #WeAreTheThey and it's amazing. Today it's been featured on The Huffington Post, Look Magazine, Plus Size Model Magazine, The Daily Telegraph and so many other places. So much positivity and I am in love with everyone who supports it. 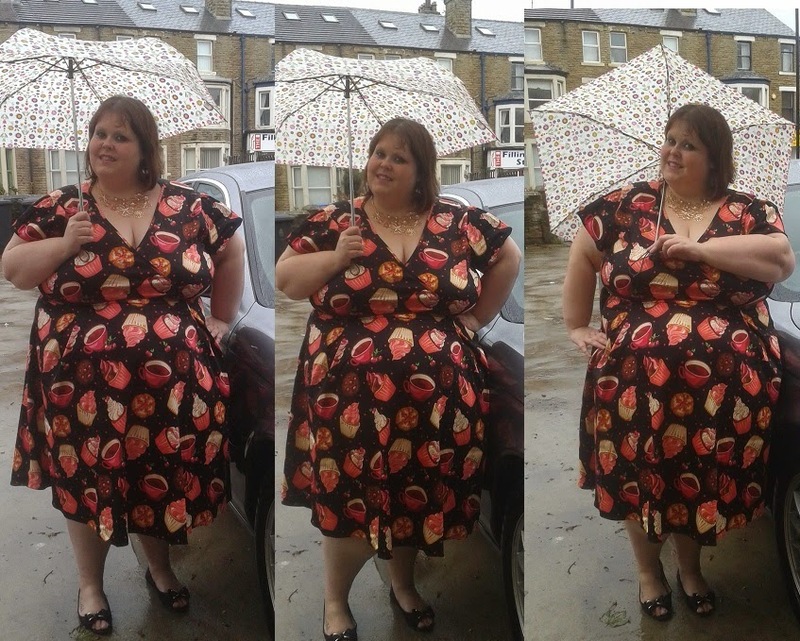 As if on cue Lady V London have bought out a brand new range of dresses under their Lady Voluptuous umbrella. If you are new to my blog then have a read through old Lady V London blog posts - I have shouted my love for them from the rooftops many times! The new dress is called Phoebe and she is beautiful! 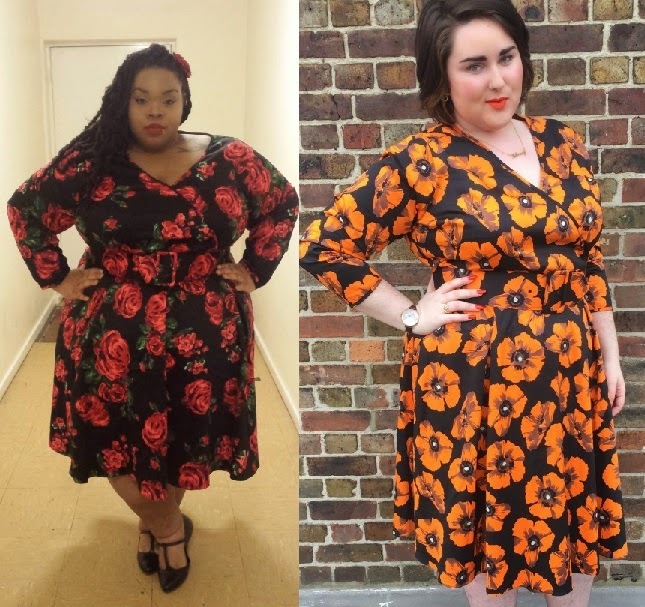 The reason I wanted to rush out a blog post about them is because as a collective Lady V London stock dresses from a size 8 right up to a size 32. There are a few retailers that stock a fantastic range of sizes but a brand that stocks size 8 to 32 is literally amazing to me. 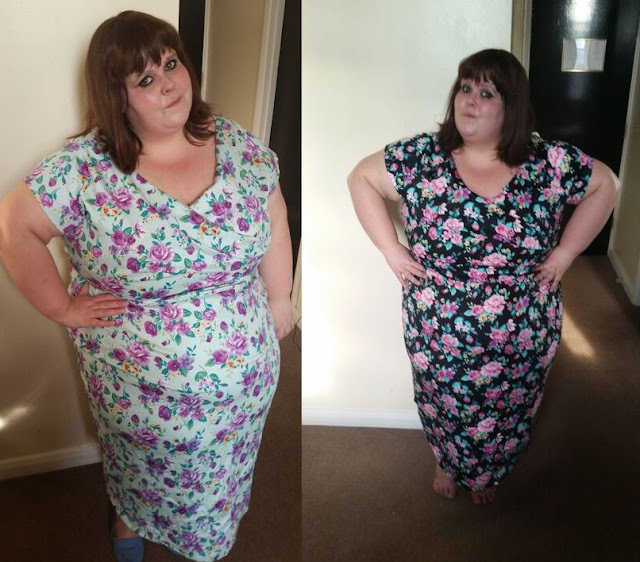 Over the last few days we have seen the #WeAreTheThey take off as living proof that we do need something like this. It is proof that as women we need clothing ranges that suit us and that small sizes, big sizes and everything in between. Personally I think I need the flamingo dress in my life, but they're all beautiful - There are also new versions of the Cossette dress! #WeAreTheThey and we need fashion just as much as anyone else! Lady V London you did good! As you will have noticed, I am a big fan of the new Lady V London/Fuller Figure Fuller Bust partnership Lady Voluptuous. I haven't yet blogged an outfit post of me in the range - but it's coming! I did blog about my love of the range here! 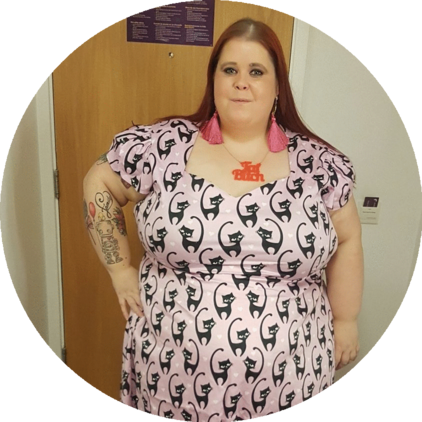 Over the past few years there have been different retailers telling us that we don't need a varied plus size range and that the type of clothing we're all keen to wear, just doesn't have a market! So... I wanted to put together a post of lots of women wearing different items from the range. To show that all shapes and sizes want all sorts of fashion and that retailers are wrong when they tell us it is not needed. 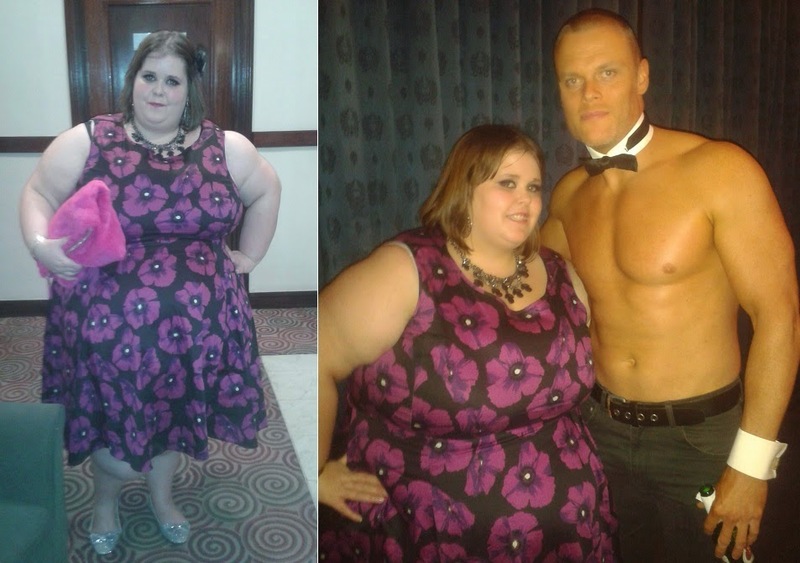 I put out some shout outs on social media and these lovely ladies sent their photos - don't they look AMAZING!? U Can't Wear That and Arched Eyebrow bloggers in their Cosette dresses! 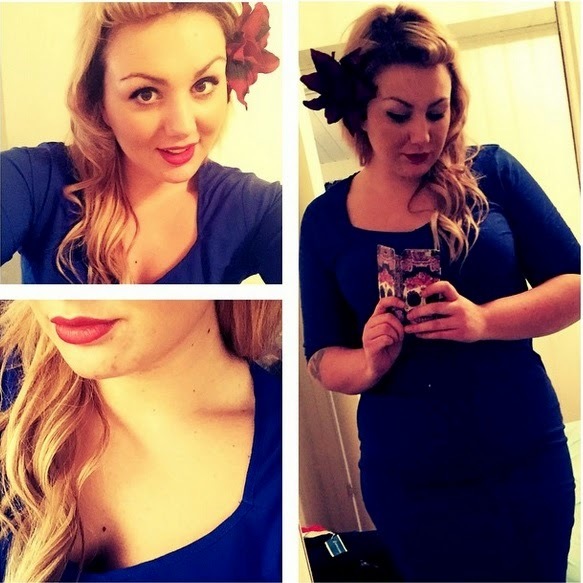 The Beautiful Linn Annett from Instagram in her Medusa dress! Jody Empson(Photo by her boyfriend) showing off her Lyra dress all the way over in Prague! 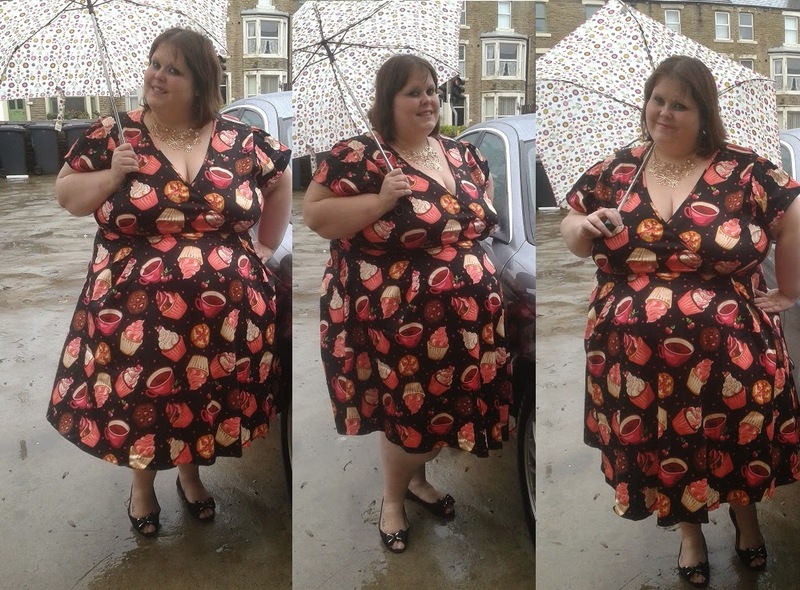 And of course, the creator Georgina looking great in some of her own designs! She's also on every photo on the website but I wanted to include these ones to show how the dresses can be styled differently to suit you! The range has only been out a week so not everyone has taken photos etc yet - but doesn't this show that these ranges are needed and that women are crying out for different styles to wear no matter their size? Perhaps I'll do another of these in the future when I can grab even more photos from even more amazing ladies! 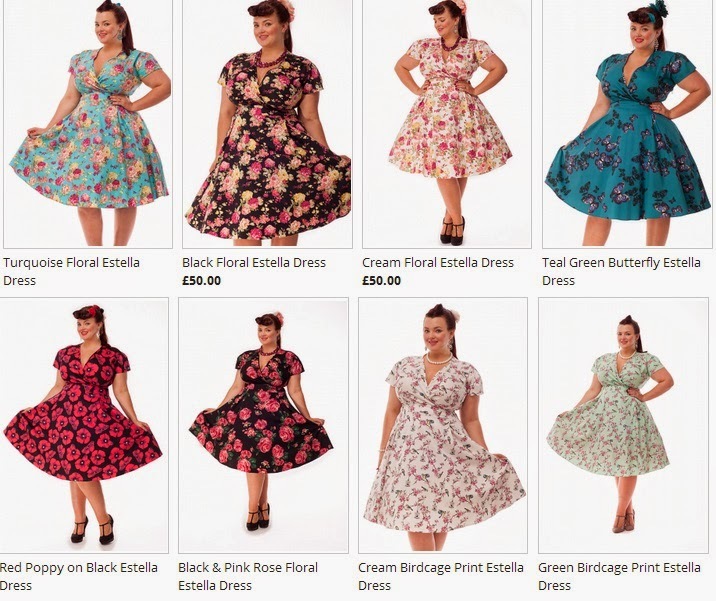 Have you got a Lady Voluptuous dress yet? Which is your fave? 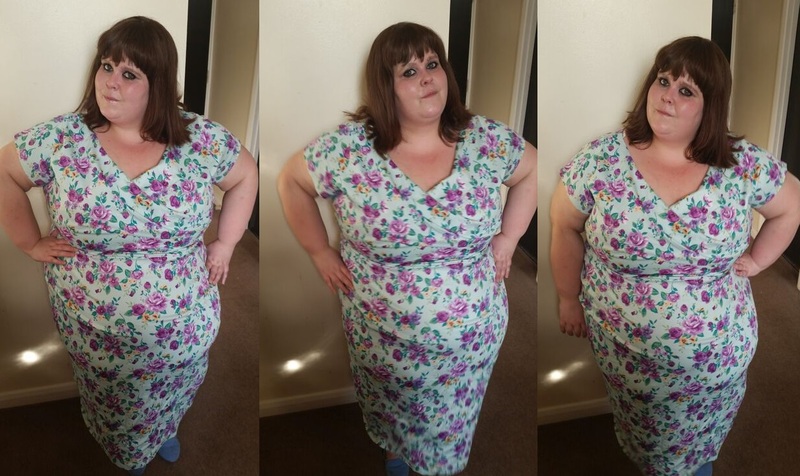 If you have read my blog before then you will know I am a massive fan of the Estella dress by Lady V London and Georgina from Fuller Figure Fuller Bust. 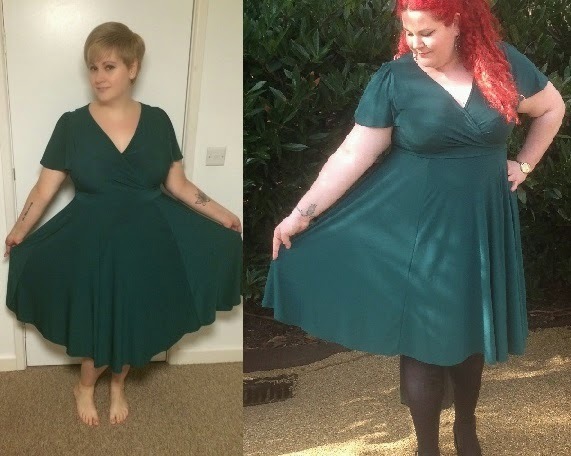 I honestly feel that the Estella dress was something quite revolutionary - in that you just can't find pretty, vintage style clothing in sizes 28+. 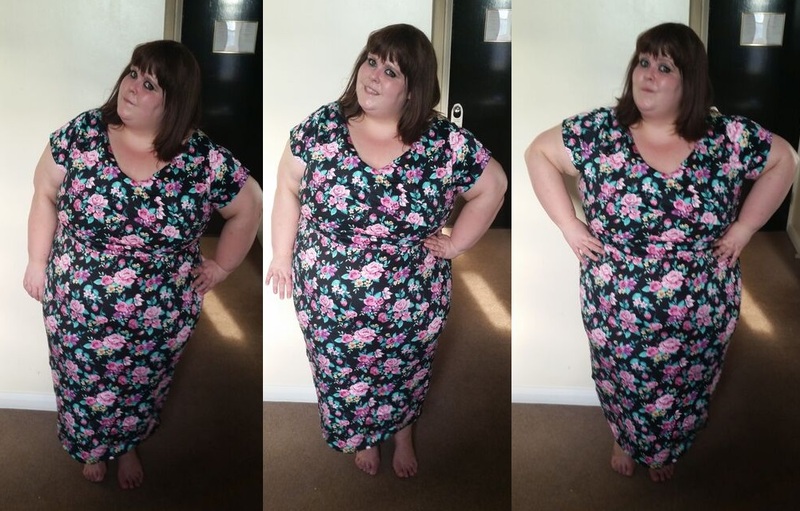 Lady V London were kind enough to send me a dress to the British Plus Size Awards - which you can read all about here. 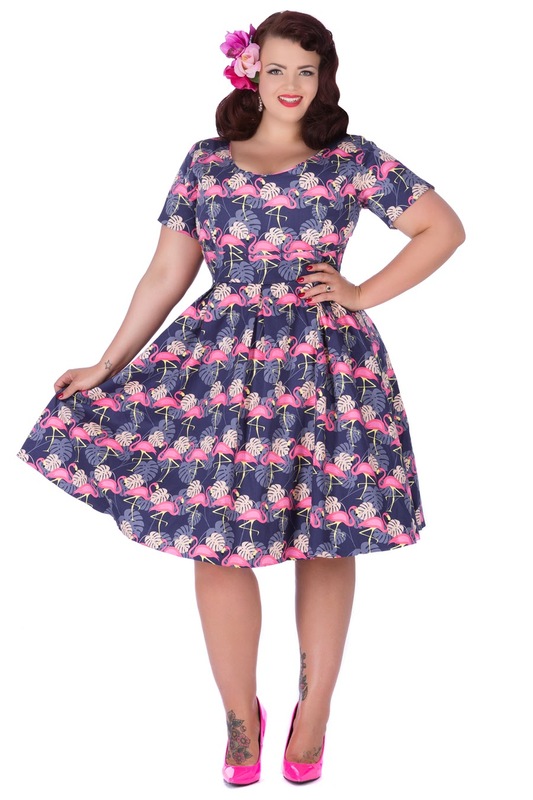 I initially wanted an Estella dress but unfortunately you all loved them so much that they sold out in my size. Lady V London actually offer 3 plus size dresses - the Isabella and the Hepburn alongside the Estella. I looked at the measurements for the Hepburn and even though it's 2 sizes smaller, the way it is cut means the they weren't too much smaller than the Estella style I was so in love with. They sent me the Violent Violet Poppy Hepburn dress and I was over the moon when it fitted. I love the shape of the dress and the pattern is not one I have seen much before at all. 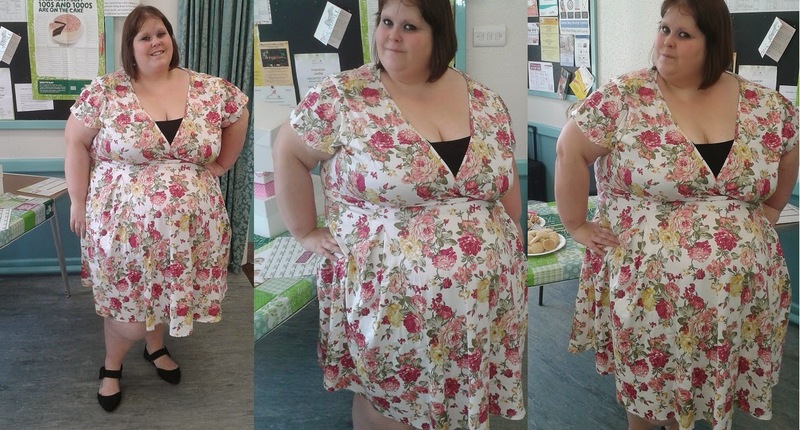 I probably would benefit from a size up was available, but once again it just goes to show that you can ignore labels and make 'too small' clothing fit you. 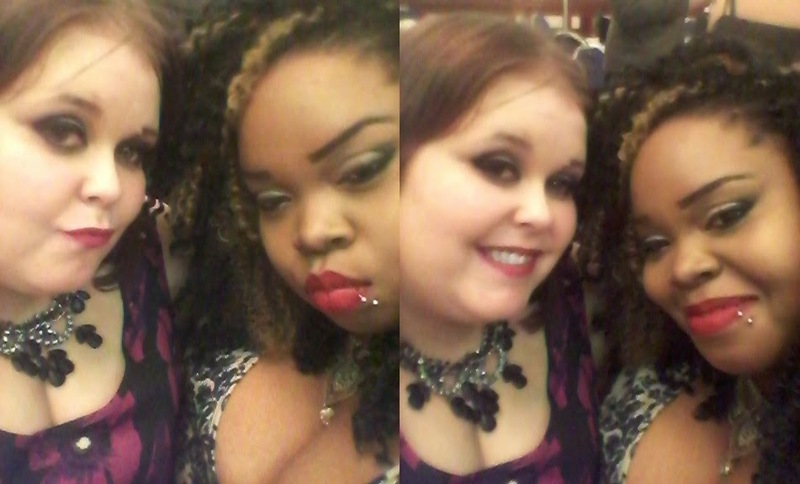 I went to the awards with Lucia from U Can't Wear That who managed to bag the Estella Damask print dress before they all went - she looked lovely! 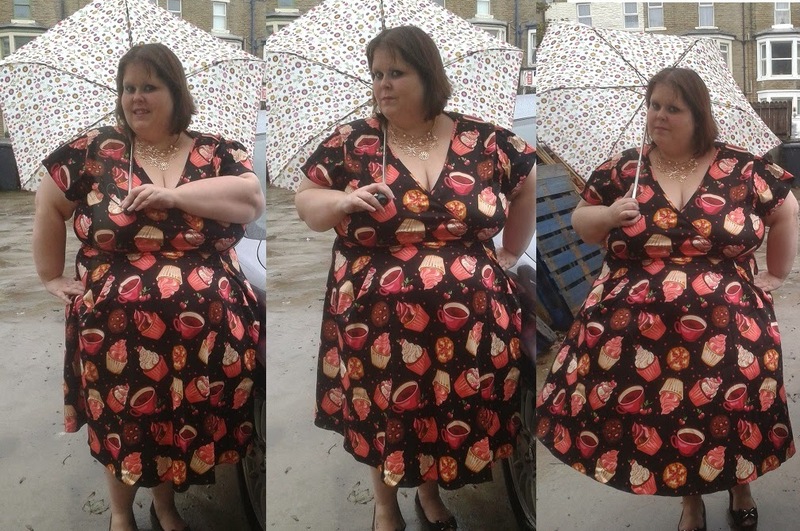 I have 3 Lady V London dresses now and I haven't a problem with any of them. I have always loved fast, affordable, bargain priced fashion. However an investment piece like this is far more likely to make my wardrobe than it did before and that is all down to the quality offered by Lady V London. I wait with baited breath to see what other Estella patterns they bring out next! As part of their Black Friday Deals, Lady V London have up to 60% off of dresses until midnight. I snapped up an Isabella to complete my Lady V London collection. When it gets here I will have at least one of each of their dresses... Review coming soon, of course! A very quick, excitable post today because Lady V London have unveiled their new Estella dresses. I do promise to do a much more in-depth post soon - and a review of a dress once I have bought one! I don't know much about the range, but it is so exciting that I had to write about it - like a child who has just been promised a new toy! WOO! 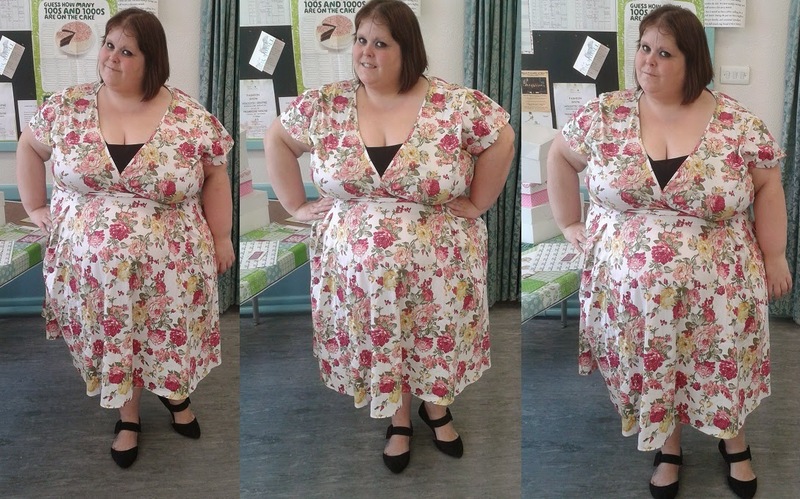 There are 8 different prints in the same style dress, all available from a size 14 to a size 32 - amazing! However, I wanted to share this today because I think it's so exciting! 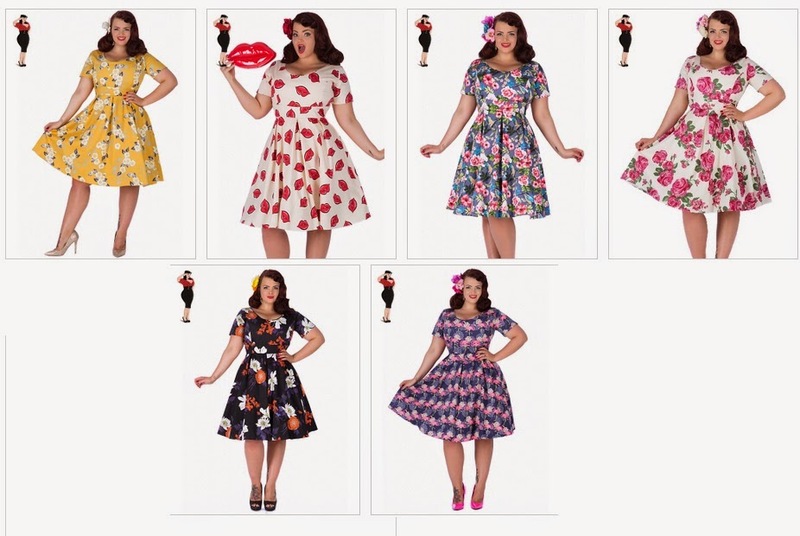 I don't know much about vintage fashion but I do know that plus size ranges up to a size 32 are hard enough to find, without something as exciting as this! The dresses were designed with the help of Georgina at Fuller Figure Fuller Bust and they're honestly beautiful... as you can see! I have three favourites - the two birdcage prints and the turquoise floral. However if I had a spare £400 knocking about (and I hadn't already spent it on the ASOS sale) I would probably want to snap up all 8 of the dresses, they're just lovely! I hope to buy one of these soon and then find a special occasion to wear it to!